The preceeding blog entries contain stories about chemical behaviour. If you have clicked on the diagrams, you may even have gotten a Jmol view of the relevant molecules popping up. But if you are truly curious, you may even have the urge to acquire the relevant 3D information about the molecule, and play with it yourself. Even after 15 years of the (chemical) Web, this can be distressingly difficult to achieve (or can it be that it is only myself who wishes to view molecules in their native mode?). Thus the standard mechanism is to seek out on journal pages that disarming little entry entitled supporting information and to hope that you might find something useful embedded there. Embedded is the correct description, since the information is often found within the confines of an Acrobat file, and has to be extracted from there. Indeed, that is what I had to resort to in order to write one of the blog entries below. I ground my teeth whilst doing so. So is there a better way? We think so! The digital repository. If you click on this you should see the entry directly. What can you do there? Well, if you have suitable programs, you can download eg a Checkpoint file of the calculation that created the molecule model and re-activate it there. Or you can download just the CML file for viewing in any CML-compliant program (such as e.g. Jmol). Or you can check up on the InCHi string or the InChI Key of the molecule. 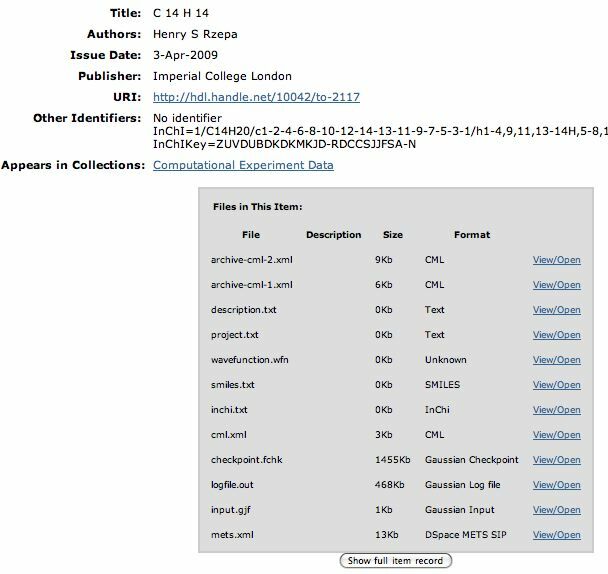 On the importance of Digital repositories in Chemistry is licensed by Henry Rzepa under a Creative Commons Attribution-Noncommercial-Share Alike 3.0 United States License.